I have been having a blast handstitching lately. I worked on another Handstitched Camp project this weekend, the Meadow Pillow. I was determined to use that Lizzy House Pearl Bracelet as the background, but I only had a fat quarter, so I hope the solid aqua isn't too weird there at the side. 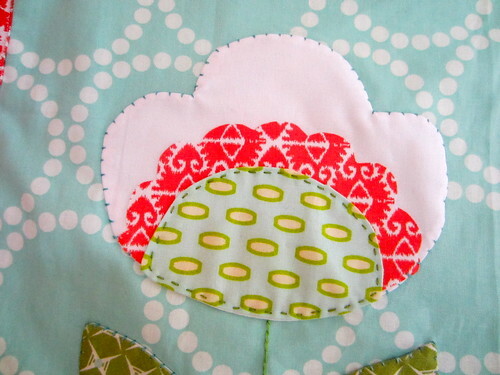 We used a few different techniques for applique. I can't say that any of them were new to me, but you still always learn some new tips and tricks and I love this pillow project. 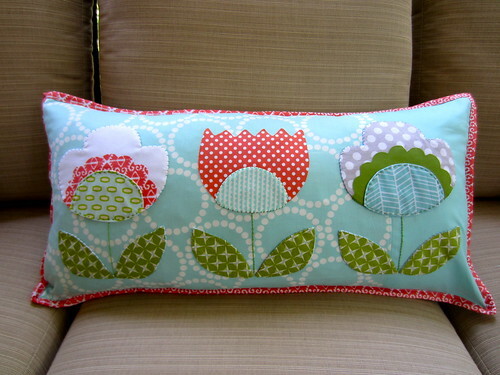 This is the first time I have made my own pillow form. This pillow is not a standard size, but I definitely think that even if I use a standard size, I should be making my own. I mean, totally easy. I actually did not have enough polyfill on hand, so I used my bag of scraps (the ones to small to sew with) to fill it - definitely made it a little heavy, but it was good to recycle something destined for the trash. I made this for my porch, to try to cozy it up a bit. 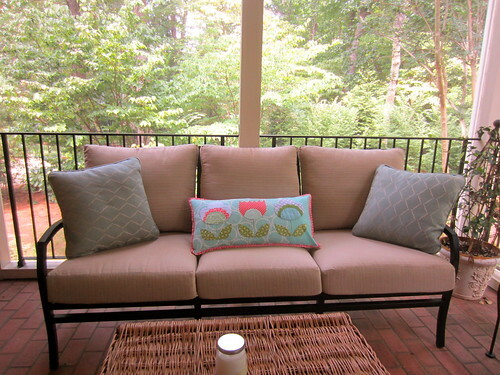 The aqua fabric I picked for the chairs & throw pillows was a little more subdued than I hoped, almost grayish, so I really want to add more color out there. I have been stuck on deciding between an aqua + olive or aqua + coral palette. I decided to try out both for the pillow. Next up I need to spray paint the big wicker basket/trunk I found in my parents' attic for my coffee table. While out there photographing my pillow, I realized I never showed you my tablecloth. I went to JoAnn's a few weeks ago and the linen was all half off. I bought 4 yards, pieced it into a large circle and hemmed the edges with my hemmer foot (my new favorite tool!). Not too exciting, but it makes me pretty happy! 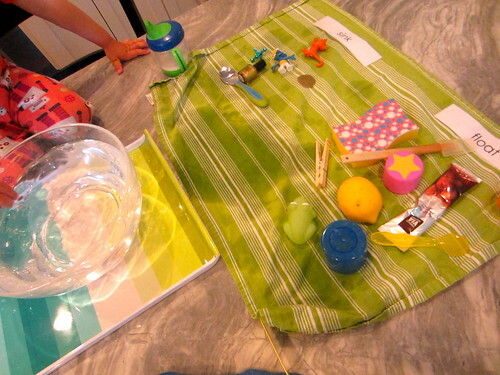 After a week at the beach, we eased back into Mama Pajama School with some basic letter practice and a fun activity. Sink or Float. Pretty easy, but the kids had a blast with it. Jack could not believe that the lemon floats! Since I washed the cushion covers on the couch we made a big fort. 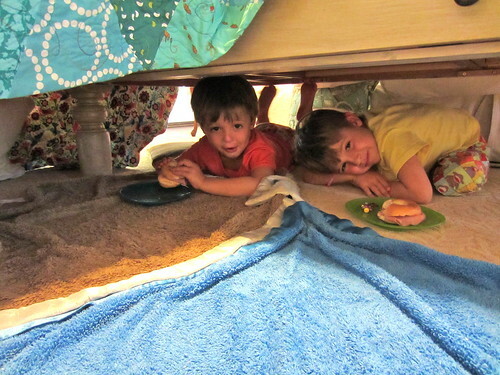 We also broke our "food in the kitchen" rule and had lunch in the fort. Happy boys! Miraculously I got about ten minutes of time outside on my porch while watching the boys play in the backyard. I was busy basting hexies. I have an idea where this is going, but am still working some details out. Love the pillow!!! The colors are so pretty and add a perfect pop of color. 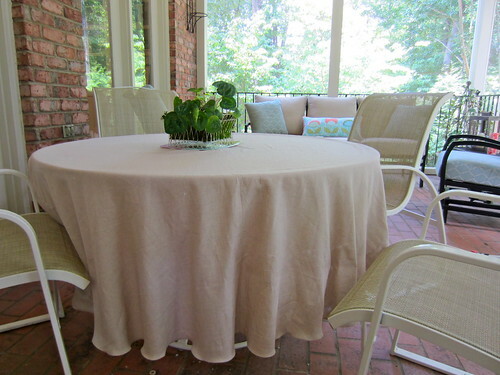 And, yay, for simple things, like table cloths, to make you happy, sometimes it's those simple things, right? Pillow is beautiful, and that tablecloth would make me happy too! I started sewing about three years ago and just recently realized that I could use the skills to make things (besides quilts!) to dress my house up a bit - things like pillows,tablecloths, curtains, etc. It added so much to my experience when I started using the beautiful fabrics I purchased to update my decor! Your porch looks just lovely! 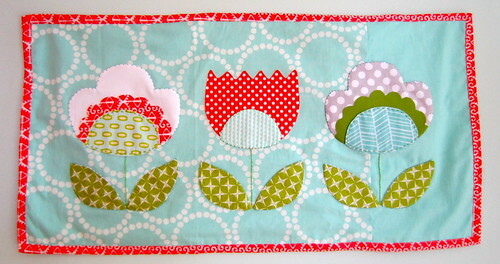 I just love your meadow pillow! I just love your pillow. Oh, I remember those "fort" days. Your boys are so cute. 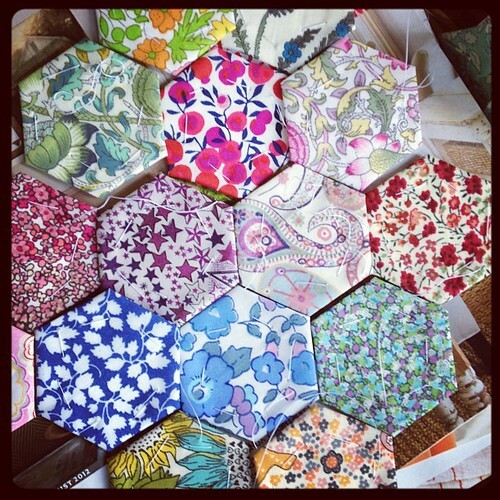 And look at all your little hexies. fun! I love the fabrics you chose for your pillow. This is one of the projects I really wanted to make, so I hope to do so, maybe a Christmas gift for someone.